It’s said that an instrument is only as good as the musician playing it, but it never hurts to give musicians a little help creating unique sounds. That’s why technology start-up ROLI recently unveiled a new type of instrument that blends the form of a standard piano with the electronic customization of a digital controller. 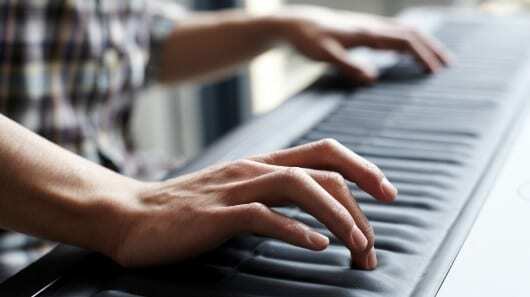 The company’s Seaboard GRAND is a keyboard that features flexible keys that allow the player to adjust each note in real-time. ROLI’s founder and CEO, Roland Lamb, invented the Seaboard as a way to merge traditional and electronic music into one intuitive device. At a glance, it looks like a regular keyboard with a soft covering, but each note actually flexes under a user’s touch and produces a different pitch, volume, and timbre, depending on exactly where it’s pressed. Any experienced pianist will have no trouble playing it, but will also have the added ability to alter the sound of individual keys as they’re being played. It can even mimic other instruments to reproduce a variety of musical sounds, like swelling horns or bending guitar strings. The Seaboard GRAND uses the unique Sensory, Elastic and Adaptive (SEA) Interface, a patent-pending platform developed in-house by ROLI. The SEA Interface is designed to detect subtle gestures in a three-dimensional space and quickly provide uninterrupted responses. The company has other plans for its platform aside from music though and is exploring alternative uses for it in robotics, gaming, medicine, vehicular control, and other professions.